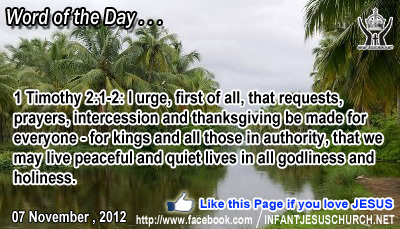 1 Timothy 2:1-2: I urge, first of all, that requests, prayers, intercession and thanksgiving be made for everyone - for kings and all those in authority, that we may live peaceful and quiet lives in all godliness and holiness. Heavenly Father, your greatness is beyond our mind to grasp but your grace reaches us and teaches in a new way each day. Pardon us when our prayer life has not been passionate. Forgive us for letting our prayers focus only on what is mistaken. Use your Spirit, O God, to ignite a hunger in our soul so that we come to find pleasure only in you and your presence. In the name of Infant Jesus and through the intercession of the Holy Spirit, we pray. Amen. The love of God compels us to choose who or what will be first in our lives. To place any connection or any control above God is a form of idolatry. Jesus confronts his disciples to look at who they love fir_st and foremost. Jesus' way to glory and power is contradictory the world's way of glory, power, and success. The preference is ours, but the Lord does not leave us alone if we decide to follow him. Does the love of Christ force us to put God first in all you do? Loving Infant Jesus, may your love change us that we may truly desire nothing more than life with you. May you always be first in our thoughts and intentions, and in our words and actions.